Blondfire doesn't have a single song that I don't like and there are only a couple that I don't love. "Into the Sea" is one of my favorites of favorites because it reminds me of C.S. Lewis. Don't know what he'd think of that. . . oh, well, he can't worry about it now, anyway. This song has a nice smooth sound with lyrics that put you right in The Voyage of the Dawn Treader. "All across this great divide, we'll make friends below the tide." Like Lucy when she's looking down into the water and sees the Sea Girl, instantly becoming friends with her. "So come with me, into the sea. Walk with me and we'll be in a different world tonight. Walk with me and we'll be alright. Don't let go, the water's warm, we'll be safe below the storm." That's the really addicting chorus, which also sounds a little like his The Space Trilogy. The second book, Perelandra, to be specific. All the "warm water" and "different world" parts. If you wanted to get really creative, I guess you could also say that " 'casue our love is ocean wide" is like the King and Queen on Perelandra, but that's probably a little too much. Well, you get the picture. It's a really cool song (by a really cool group), so I'm bound to compare it to some really cool characters/settings. Most of my other books are a little sturdier than this one, but I really like the idea that if one of them has to look beat up (the spine is pretty wrinkled, too), it's a Charlotte book. 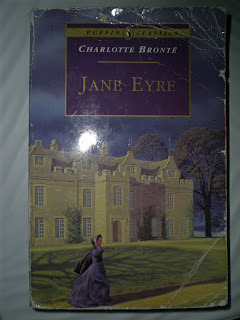 Just a quick rundown of why I think Charlotte Bronte is amazing. She has a genius balance in her writing, reality and "fantasy," passion and self-control, love story and social commentary/morality. So many of the things I like in books, I can find in hers. She's also easy to read, being very plot-driven and emotionally fervent. But then you can still go back and find all these layers you didn't pick up before, different ideas that go past the basic themes. And don't forget that her characters all know the difference between happiness and joy. Again, I'll say more on this by and by, but this is just a starting place. I keep on hearing people say they like reading so they can relate to the characters. But what I like is relating the characters to each other. I'll come up with all these unlikely comparisons, then look for a victim I can explain the similarity to. Maybe the victims will have a little rest now that I have this blog. Anyway, books are to me something to think about. They keep your thoughts alive, whatever their genre. Which brings me to another point. Books all serve different purposes. There are the ones more for entertainment and the ones that give you a new idea to turn about in your head. Of course, it's always great when these two go together. Like in, oh, I don't know, Charlotte Bronte's books. You'll quickly find out that I absolutely adore Charlotte, but I'll have to save that explanation for later.